VMworld session public voting – vote early and vote often » Welcome to vSphere-land! Well maybe not often, that’s the way they used to do it in Chicago in the old days. 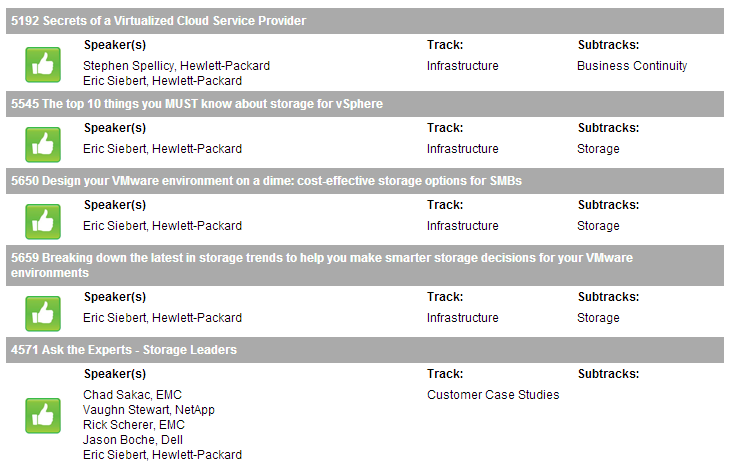 I did want to make a plea to get your votes for my sessions at VMworld. I have several I submitted as part of HP and I promise to make them as technical as possible. My Top 10 things you must know about storage for vSphere session is crammed full of technical info, so much so that I’ve had to trim it down twice as it could easily go over an hour. Before I highlight my sessions I wanted to mention how crazy it’s gotten trying to get session submissions approved for VMworld. Back in the ole days (2008) when I first presented at VMworld, there weren’t a lot of bloggers, there were a lot less partners and VMware had a lot less products. Fast forward to today and there are hundreds of bloggers (200+), hundreds of partners and VMware has a boatload of products. As a result they get a crazy amount of submissions each year and with very limited session slots it’s extremely difficult to get one. What really impacts it the most is that VMware has gotten so big with so many products that they need a lot of session slots to cover them all, that doesn’t leave much for partners, who are guaranteed some slots and that leaves hardly any for bloggers. It’s a shame as there are so many great session submissions each year but there are so few slots to fit them in. Which brings me to the public voting, VMware lets public voting have an influence on the approved session outcome. Public voting is just a percentage of the methods used to approve sessions, a big part of it is the private content committee judging that is done. With the content committee, every session is given a look over and scored by the committee. Where it becomes extremely difficult is with public voting, there are so many sessions on the ballot that it quickly becomes overwhelming and nobody has time to go through them one by one. Therefore many people skim through them or look for specific sessions that they know about. What becomes really important is the title of your session, which is essentially the curb appeal that draws people in to take a closer look at your session. Many people don’t get past the titles and only look at interesting and catchy titles. When you are confronted with over 1200 sessions to vote on, you simply don’t have the time to look at them all. What I find that helps a bit is filtering on tracks, keywords or speaker names. It’s still a difficult task though, imaging voting for over 1200 people running for president, it’s just too much. So with that I’d like to point out my sessions and let you take a look and see if you judge them worthy of your vote. I appreciate your consideration and vote or no vote I look forward to seeing you at VMworld anyway. Even if you don’t vote for me you should still get out there an vote.